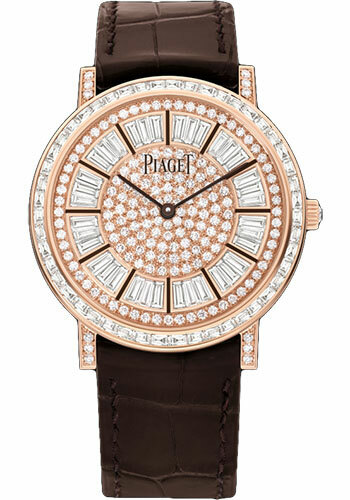 41 mm 18K rose gold case set with 313 diamonds (approx. 1.7 ct) and 48 baguette cut diamonds (approx 2.5 ct) and 155 brilliant cut diamonds (approx. 1.8 ct) and 36 baguette cut diamonds (approx. 3 ct), 6.44 mm thick, sapphire back, diamond (approx. 0.1 ct) crown, diamond bezel, gem set dial, 1200P automatic movement, approximately 44 hours of power reserve, brown alligator strap, folding buckle set with 24 diamonds. Water resistant to 03 ATM.